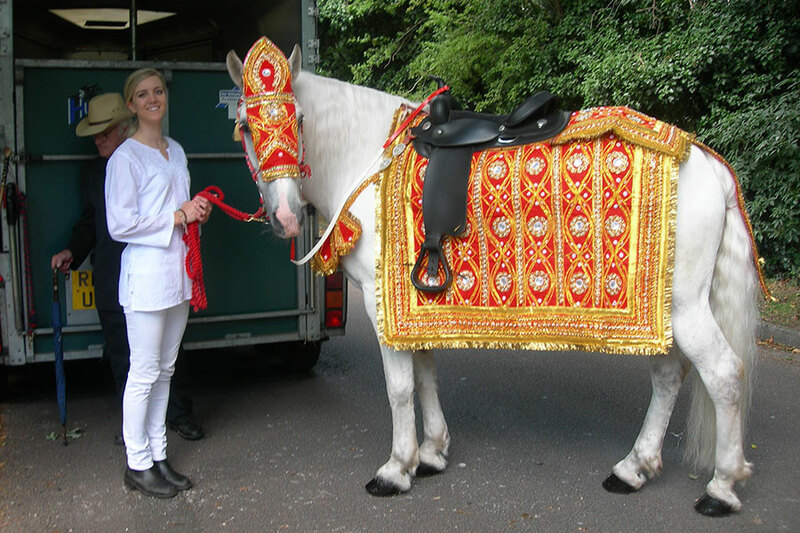 Our magnificent White Wedding Horses include ‘Diamond Prince’, star of the SKY TV Shaadi Show, all have experience of Asian wedding processions with Dhol Players and Brass Bands. We are preferred suppliers to many Asian Wedding Venues in the South East of England and have worked with the best Asian Wedding Planners. We take great pride in presentation, and our horses are dressed in traditional costume and led by a qualified Horse-Handler. Please call to discuss your requirements. For a quotation please call 07811 543019 or email info@ascotcarriages.co.uk or use the contact page. 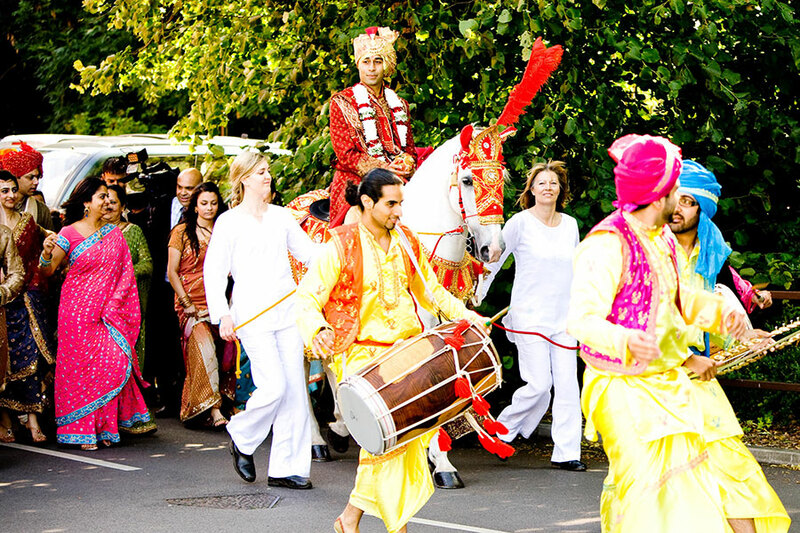 All we need is the date and time of the procession plus name & postcode of your wedding venue. 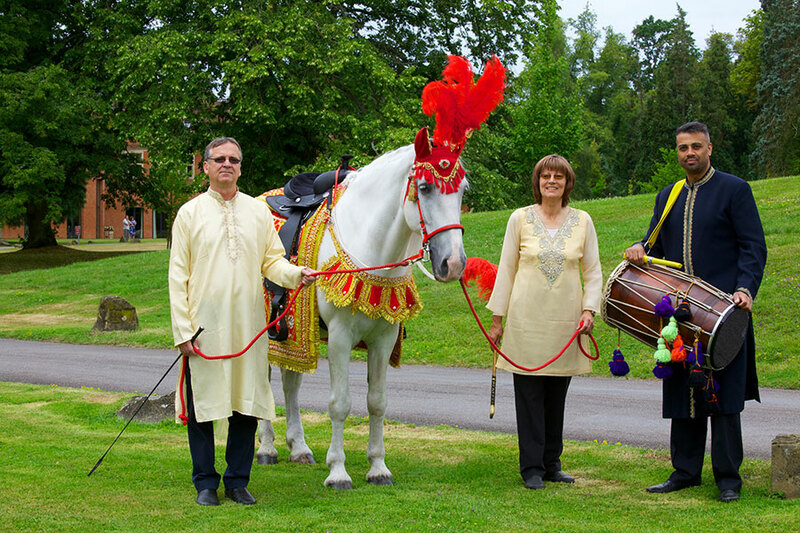 If you are not sure whether you would be confident to ride a horse on your wedding day ask about our ‘rehearsals’ you may come and have a trial ride on the Shaadi Show horse based near Windsor before your wedding and the bride can come too as she will not see you riding the horse on the day itself. Just wanted to say a huge thank you for providing a really fantastic service! Everyone was really impressed and Diamond Prince was the talk of the event! I have to say the service you provided was absolutely impeccable and it was a pleasure to have you, Diamond Prince and your team as part of our event. The horse was thoroughly prepared and looked magnificent. Great temperament too! Jo gives George Watts of Wedding TV a light hearted introduction into what’s involved in preparing an Asian Wedding Horse for a procession. Click on the image below to view the clip in YouTube. To make a booking or for more information contact Joanna on 07811 543019 or via email at info@ascotcarriages.co.uk.